Elektra was one of numerous super-powered individuals that the Skrulls abducted and replaced with Skrull agents necessary for their invasion of Earth. Once the Skrulls were defeated, the real Elektra was released from Skrull captivity and into the hands of S.H.I.E.L.D. However, S.H.I.E.L.D. was decommissioned and replaced with the organization H.A.M.M.E.R., meaning that Elektra was now in the hands of Norman Osborn. And Norman, as a part of his plan to 'keep the public safe from alien threats', wanted to know the Skrull's rationale for only experimenting on Elektra and none of the other captives. Norman began studying, analyzing, and even torturing Elektra in order to get that information. However, the mercenary Paladin soon infiltrated H.A.M.M.E.R. facilities and attempted to kill Elektra and collect the $82 million bounty on head. Paladin botched the job and Elektra was able to escape, leaving Norman looking for answers as to 'who' placed the bounty on her head. Norman then unleashed Bullseye, who was operating under the identity Hawkeye in Norman's Avengers, to capture and kill Elektra. 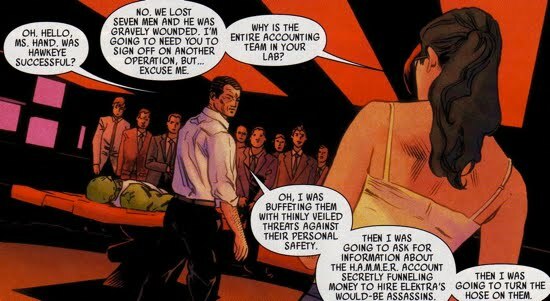 While Bullseye was hot on her trail, Osborn found the Skrulls that were responsible for the testing on Elektra and he tortured them until the gave him the answers he desired. While Osborn tortured the Skrulls, Victoria Hand uncovered the person responsible for putting the hit out on Elektra, it was S.H.I.E.L.D.! More specifically, the initial deposit given to Paladin originated from an account within S.H.I.E.L.D. labeled 'Blackhawk', which is the name of a S.H.I.E.L.D. helicarrier that Elektra was responsible for destroying. The question for Norman then became, was it the real Elektra or the Skrull Elektra responsible for the destruction of the helicarrier. Meanwhile, Bullseye failed to subdue Elektra, in fact, she gravely injured him after he confronted her. Eventually, Elektra made her way to the S.H.I.E.L.D. forensic site that housed that Blackhawk wreckage, it was at that site that Elektra found the man responsible for the hit on her, S.H.I.E.L.D. Agent Brothers. After Elektra confronts Brothers, Osborn appeared on the monitors found in the labs. He informed Elektra that she was responsible for the destruction of the Blackhawk helicarrier, not her Skrull imposter! He also explained to Elektra that the Skrulls were immensely interested in her specifically because she had been resurrected from the dead and the Skrulls found value in Elektra because they sought eternal life. Elektra accepted the truth from Osborn, then killed Agent Brothers. Its fair to say that Elektra was placed on Norman Osborn's 'uneasy truce' list. He allowed her to escape the S.H.I.E.L.D. forensic site but then tells her, "I'll still have to kill you someday, of course. It looks bad, you running around." With Norman in detention at the Raft, its unlikely he'll make good on that desire any time soon. So the Skrulls were interested in someone who had 'been to the other side'...they should've taken Norman...he's been resurrected as well! There were some other interesting incidents as well, how about this one, Victoria Hand helped Norman to get dressed...so how close were they?